Health workers currently immunizing thousands of children and young adults against Meningitis A in Benin are currently doing so without having to spend days preparing ice packs and sourcing generators and fridges to load on trucks because the vaccine has now won approval for being kept at up to 40 degrees Celsius for as long as four days. Before, like almost all vaccines, the Meningitis A vaccine (marketed in Africa as MenAfricVac) was only licensed for use if kept at temperatures of 2-8 degrees Celsius. The breakthrough follows years of rigorous testing of the effect of heat on the vaccine by the regulator Drugs Controller General of India, Health Canada, and the World Health Organization (WHO) Vaccines pre-qualification programme. As a result, very remote populations will access the vaccine more easily, the logistics of vaccine campaigns will be simpler, and vaccine campaign costs will drop both for partners and for national governments, said Michel Zaffran, coordinator of WHO’s Expanded Programme on Immunization (EPI), and Marie-Pierre Preziosi, director of the meningitis Vaccine Project, a partnership between international NGO PATH and WHO. Costs will not drop significantly immediately, but will diminish as more vaccines are relicensed, says WHO. Cost implication studies are under way in northern Benin and Chad. While cold chain limitations do not tend to limit coverage, they do overburden health workers, says WHO. Even industrialized country vaccine campaigns have trouble sticking to the cold chain, and each year thousands of vaccines are thrown away due to cold chain failure, even if the vaccine might still have been unaffected, according to WHO. But the vaccine is nothing new - merely the license has changed following analysis of years of data on the vaccine’s stability - that is, how well it can withstand temperature rises and other conditions. It took decades to get here because agencies got stuck in a mindset, said Zaffran. The EPI was set up in the 1970s to immunize as many children against diseases as quickly as possible, and put in place simple rigid rules to avoid risk: one of which was to keep vaccines cold. “It was quite difficult to move away from this mentality,” said Zaffran. Strict controls remain: “This is not a “green light to do anything with a vaccine - it still needs to be kept… at no more than 40 degrees, for any more than four days," stressed Zaffran. “The momentum is there. I am quite confident that within the next year or two, we’ll have one or two more re-licensed in this way,” he said. Analysis on the heat stability of Hepatitis B and HPV (human papillomavirus) vaccines is under way; next on the list are yellow fever, rotavirus and pneumococcal disease. Even the oral polio vaccine - one of the most heat-sensitive vaccines - was shown to be stable when the cold chain broke down in a part of Chad, according to a recent study though WHO was emphatic that rather than licensing the vaccine it will gradually be phased out as progress towards eradication inches along. The MenAfricVac, which costs just under 50 US cents per dose, was designed for use in the 26 countries that span the African meningitis belt, from Senegal to Ethiopia. Some 100 million people aged 1-29 across 10 countries have been vaccinated thus far; a further 16 countries are planned between now and 2016. Early results have been very positive: Burkina Faso has had the lowest level of epidemic meningitis in 15 years, and the campaign is achieving “herd immunity” - that is, those either too old or too young to have received the vaccine have also been shown to be clear of the bacteria. 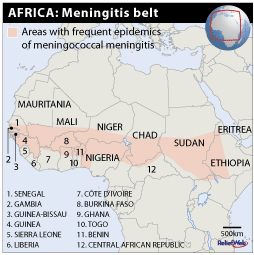 Meningitis A could be eliminated in the meningitis belt if the mass campaign continues, says Preziosi, and if governments then incorporate it in their routine immunization programmes. But more funding beyond the US$160 million from the GAVI Alliance, and contributions from national governments, will be needed to complete the campaign, she warns.